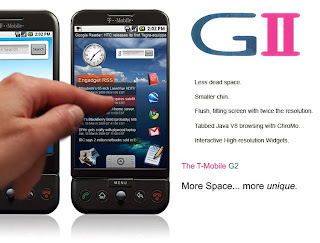 T-Mobile G2 with VGA camera, a follow-up to the Google Andriod mobile operating G1, coming soon? The product specs on the T-Mobile G2 that CellPhoneSignal ran weren't actually all that far off, just the date was completely wrong. The device is a full touch device and there is no physical QWERTY keyboard. There is still a trackball at the bottom. The launch was delayed from late February to April due to software issues. We've been informed this device will actually launch on another global carrier besides T-Mobile as well, though they didn't say who, and they said that the G1, G2, G3, etc., names are trademarks of T-Mobile and the other carrier would have a different product name for the device other than G2. There is supposedly (oh, god) a G3 coming not that far after the G2 but our tipster didn't see the G3. Google Introduced couple of new technology in the web(as usual). On this, GAudi is the new revolution in the online video management. GAudi brings new features in Google video and youtube. Please have a look at it. Google Audio Indexing is a new technology from Google that allows users to better search and watch videos from various YouTube channels. It uses speech technology to find spoken words inside videos and lets the user jump to the right portion of the video where these words are spoken. Compare Quotes allows you to compare quotes from different people in the News about a particular topic. The feature currently allows you to choose and compare quotes from political candidates and other political figures. Now you can use your skype for online meetings by adding a plugin which is absolutely free. Skype having 2 diff plugin for this kind of feature. I tried Mikogo , it works great in all windows (NT, 2000, XP, Vista). but for me Yugma Team Collaboration getting crashed. - and many more uses! I think this will be very useful for our internal meetings. I can say Zoho is the real competitor for google in the online application products, because they are providing more number of online applications and more depth features in all the application. Now everything is in online, for free. You can use your google or Yahoo account to use these applications. I can tell you one feature which Zoho provides in his Word application, which I never ever think of. We know we can make a word document as readonly for some users and give permission for some specific users to edit. But using Zoho, even further you can configure a particular paragraph to be readonly for particular user. Even thought they have the rights to edit the document, they cant edit a particular paragraph. How is this? It supports most of the browsers, including safari (I think brad will be happy to use this in his mac), and chrome. So this will be a good solution to avoid and make our code very clear and structured way. Based on the JSDoc.pm project, this was renamed "Jsdoc Toolkit" during development as it grew into more than a simple version upgrade. ZK is the leading open source Ajax + Mobile framework. With 700,000 downloads, ZK empowers a variety of companies and institutions, ranging from small to large, including Barclays, Sun Micro, Swiss RE, Alcatel-Lucent, and many others. "Clone Digger is a new tool detects duplicate code in Python sources. It has been applied to several open-source projects, which found that about 12% of their code consisted of clones. This article explains how to use Clone Digger in your own project and gives you the theoretical background in the related fields." I found this tool from python magazine(http://pymag.phparch.com/). I am really impressed with this tool. Very handy and very very useful. Append a plus ("+") sign and any combination of words or numbers after your email address. For example, if your name was hikingfan@gmail.com, you could send mail to hikingfan+friends@gmail.com or hikingfan+mailinglists@gmail.com. For me, the real value in being able to manipulate your email address is that it makes it really easy to filter on those variants. For example you could use hikingfan+bank@gmail.com when you sign up for online banking and then set up a filter to automatically star, archive or label emails addressed to hikingfan+bank. You can also use this when you register for a service and think they might share your information. For example, I added "+donation" when I gave money to a political organization once, and now when I see emails from other groups to that address, I know how they got it. Solution: filtered to auto-delete.